This week’s tip – Hosting a Contest – can create excitement and increase traffic to your website. (And as part of this tip, we have a small fun contest of our own). Why A Contest? With the news about the economy as dour as ever, a contest can be a great way for people to take two or three minutes out of a hectic day and “escape.” One of the reasons why movie ticket sales are way up is the psychological desire of consumers to transport themselves into a fun alternative world for a few hours. Your contest can be relatively simple or extremely elaborate. But the goals are the same: You ask people to do something that directly or indirectly benefits your organization. You reward their behavior with a prize or chance to win something of value. The type of action you ask people to take can vary depending on your audience and the perceived value of the prize. For example, if you’re giving away a new car or luxury vacation, people expect to jump though many hoops. 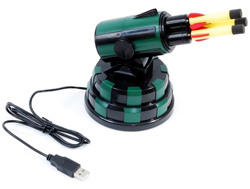 If you’re giving away free movie tickets (or in our case, a Free USB Missile Launcher, see below), the threshold should be a bit lower. Your contest may ask people to: Answer A Short Quiz: (1-3 minutes; engages their mind to think about your company) Sign up for an email newsletter (1-2 minutes; quick, fast and easy, allows you to communicate with them going forward). Give you their mailing address so you can send them a brochure or catalog (2-3 minutes; takes a little more time to type in) Take a short survey (3-10 minutes; there’s uncertainty about how long the survey will take) Write a 100-word essay on why they deserve to win (10-30 minutes; takes cognitive thought) Submit photos or a video (1-2 hours; requires some additional technical skills) Find something on a website (3-10 minutes; gets people to interact with your site) Our Fun Contest: If you haven’t seen a USB Missile Launcher, it’s something that plugs into your computer, and shoots up to three foam darts. It’s a great way to annoy co-workers, and it makes a great gift. You control it with software on your PC. In order to get a lot of people to visit our site and conduct a mini-scavenger hunt, I’ve placed my cell phone number on one of the pages. The page on the site is accessible from the home page and all other pages of the site. 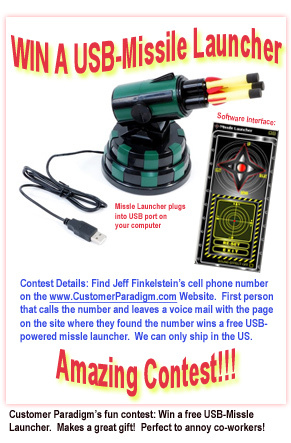 The first person who calls the phone # and leaves a message with the name of the page they found the number wins a USB Missile Launcher. Unfortunately, we can only ship in the U.S. Why are we giving this away? It’s a fun way to give people an incentive to read through the site and find out all of the things that we do. Visit here to try to find the cell phone # >> What type of contest might make sense for your organization? I also hope that this contest gets you to think about a similar contest that you could run for your organization, too. It might be a contest at a trade show, or conducted on the Web.